Released from the old biological constraints, women flooded universities and the workforce, developing their skills, expanding their incomes, and doubling our national talent pool. Most women still want to be moms — on the new terms that allow them to participate in civic life as well. But while they now hold a majority of middle management jobs, 49 years later women still haven’t done more than trickle up into policy-making roles. Currently women (51% of the population) hold 17% of Congressional seats (a new high). In the business world, where women now hold 50.6% of professional and management positions, they comprise only 15.2% of boards of directors and 3% of Fortune 500 CEOs. Well, basically, men — particularly of the legislative and business-heading types. While our male leaders and representatives might have facilitated change on behalf of their female constituents and workers, with few exceptions they’ve failed to do so, leaving the old and actively family-unfriendly business model in place. 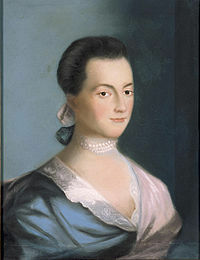 Like John Adams, whose wife Abigail (see above) famously enjoined him to “remember the ladies” as he developed the constitution, most somehow forgot. Even though women can now time their births, our nation’s lack of a family-support infrastructure holds them back — and mothers especially — with a dirty laundry list of inequities: unfair pay, job ghettos, inadequate childcare, no sick leave, limited career tracks, and more. Increasingly access to birth control and abortion have been limited as well, especially for the poor. We’ve heard this list so often, it’s come to seem insurmountable. But the stress and struggles women workers and their families undergo while trying to do their jobs are not only a national disgrace — they’re completely unnecessary. Two examples: Our military runs a strong childcare system, with trained, well-paid workers; a similar system could work for the rest of us and create hundreds of thousands of good jobs. Pay equity may frighten employers who’ve depended on cheap female labor, much of it in unexportable care work, but if women were paid more, they’d spend more — revenue neutral for the economy but an important corrective to the current gender power-imbalance. Women with money could contribute to the campaigns of women candidates, and women with good childcare could stay in their jobs and climb the ladders to leadership roles in business. Things would change — for the better. Circularly, because the support infrastructure hasn’t changed, women haven’t been able to move in sufficient numbers into positions where they could change it. The rationale we’re given for this mistreatment holds choice against moms: It was their choice to have kids, so any consequences are their problem. But mothers’ work produces not just the happiness of their families; the kids they bear and raise are essential to the operation of commerce and of the nation, which demand citizens, workers and consumers for their continuation — and good ones at that. It’s in our national interest to ensure that all families can do well and women workers do not suffer because they choose to raise the next generation while also contributing to the wider economy and civic life. Our business model is outdated in not providing circumstances in which women can contribute to the fullest, and earn a fair wage. When women’s insights into how to make our systems better meet our nation’s needs, including but not limited to the needs of women and families, are not taken seriously at the levels where they might be implemented, every one loses. Part of the problem is systemic. As legal scholar Lani Guinier explains: “Whoever designs the game or defines the rules predicts the outcome…[Then] the winners tell…the losers that it is futile to resist.” This is true for all biases, not just gender. As we’ve seen, the narrative we’re handed justifies the status quo. In this case, as in others, the game was established in a very different landscape, and the rules no longer makes sense for any of us. Men as well as women will be better off when we even up the playing field here. In fact, things have been improving incrementally, and we may now be approaching the critical mass needed for a game-changing jump. Women have trickled up to the point where even our incredibly low version of a Congressional high has had visible effect. The Speaker of the House is now a woman, and she and her ilk have put pay equity and paid sick leave on the agenda. Not the same as passing, but progress. Big sister is helping mom. The Obama administration has already signaled its woman-friendliness through a number of bills already passed and through its creation of a White House Council on Women and Girls to scrutinize the gender-effects of legislation. Michelle Obama, self-styled Mom-in-Chief with an impressive employment history and a new full-time job as first lady, exemplifies in her daily life the importance of support for both dimensions of women’s work. She and Vice President Biden’s Middle Class Task Force have committed to advancing America’s work/life balance. But mama needs more, including the Commission on Women proposed by Congresswoman Jackie Speier, to take a big-picture look at the circumstances that hold women back economically and socially, and to recommend specific actions to rectify those. (Perhaps the threat of a diversity quota on boards of directors could get industry moving.) Here in Houston we recall a conference with a similar charge, held in 1977, which came up with 25 policy recommendations. Those were then overwhelmingly ignored by the same Carter administration that had called the conference. Back then, there were no women in the Senate and few Congresswomen. This time, there’ll be follow-through. To guarantee it and to promote further positive change, we need ongoing active citizen support for the pro-equality legislation proposed by current office holders, male and female. Successes or even near successes in these battles can invigorate women and increase the stream of female candidates. (Women’s candidacies in the last election have already led 30,000 girls to apply for a training workshop on political leadership for which fewer than 300 applied last year.) Female candidates won’t all agree on everything, but their presence in the race will change the discussion in ways that will make what used to seem impossible suddenly look do-able. The recent collapse of the finance markets makes this a particularly auspicious time to consider alternative models for doing the nation’s business. The culture of greed has failed. Who better than mothers to turn to for wisdom on how to build a culture of care — one that assumes, for starters, that everyone in the national family deserves respect, fair wages, and a solid education. One that recognizes that we are our common wealth. Time for legislators to remember the ladies, and the mamas, at last. It becomes harder to forget them when they’re there in the same room, voting for themselves. Since nobody else is going to do it for them. that period). It’s bounced around in that vicinity ever since, reaching an all-time low in 2002 at 64.8, and a recent high in 2007 at 69.5. While the Pill was developed to assist women (at the behest of and with funds supplied by women), it also arrived at a point when the world needed fewer babies. Infant survival rates were up, health gains meant people lived longer, technology innovations meant farms needed fewer workers, and the globe was getting crowded.